Inaugural lecture provides an opportunity for academics to share their achievements in research, innovation, engagement and teaching activities before an audience of members of the university community and the general public. 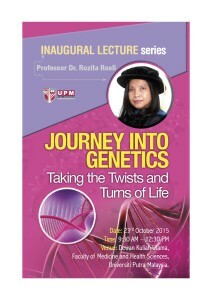 GRMRC’s Prof Dr. Rozita Rosli has been offered the opportunity to deliver an inaugural lecture titled “Journey into Genetics – Taking the Twists and Turns of Life” on the 23rd of October 2015 from 9.30am-12.30pm at the Faculty of Medicine & Health Sciences, Universiti Putra Malaysia. Everyone is invited and the Lecture is free and open to the public. Please RSVP by sending your name, email, position and affiliation. Notes: Please RSVP by sending your name, email, position and affiliation.